Ever been tired, thirsty and found it hard to pee? Here is a solution that is easy. The Smart Water Bottle. As one of our team members went through NS, he went through a lot of heat injury cases due to dehydration. Moreover, people like us who are in seated jobs often don't drink enough water as we don't get thirsty in an Air-conditioned environment. It is vital for a human to be hydrated at all times to maintain all bodily functions in an orderly manner. For a hot country like Singapore, it is crucial to ensure that everyone consumes enough water to stay hydrated. Our smart water bottle tracks your water intake. It is fully customisable to your water intake requirements using our smartphone app. You can set the total amount of water you wish to drink and the frequency you want to drink it in. It has LEDs to let you know how much water you have consumed and when the last time you consumed water was. Also, it sends notifications to your phone to let you know the status of your water intake. 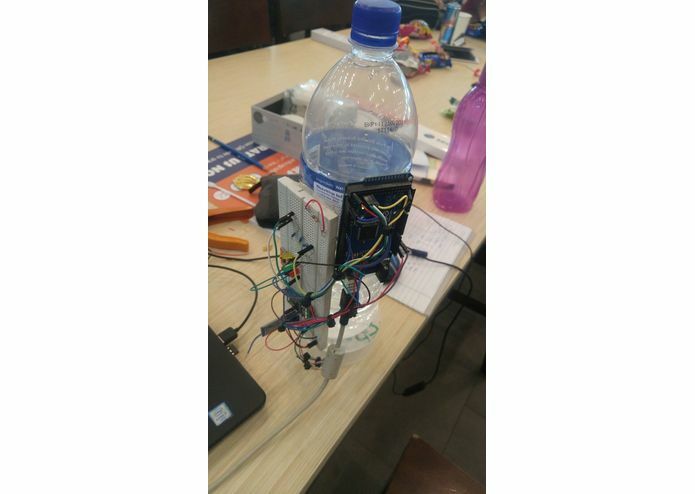 We built it using a 3D Printed water bottle mount, a hand made weighing scale, an Arduino Atmega2560 and an Accelerometer coupled with a Bluetooth Master/Slave device that links to your phone. We couldn't afford and/or find a sensor that could measure the water level in a bottle, so we modified a weighing scale to find the change in mass every time you drink and used the density formula to see how much volume of water you have consumed. Challenges that we faced were also that the circuits would often run into problems and stop working all of a sudden. We overcame this using neat cable arrangement. We also had several issues with Arduino's inbuilt timer, we overcame this by accessing the Registry of the function and resetting it whenever we needed. This took us about 7 hrs. We are proud of the fact that we made an android app on MITAppInventor in 1 hour without any prior knowledge whatsoever. Also, this has been a project we have been wanting to work on for a long time, we are glad that we have been able to do it in a matter of just 24 hrs. We learned a lot about app dev, about Arduino, about team work and the power of Redbull in keeping one awake. We wish that this project could be taken to the next step, refined a lot more, be able to accomodate all phones and liquids and be much more accurate. Maybe, just maybe, you might see us crowdfunding our very own smart water bottle of the future. I worked on the code and the app. I helped build the bottle and in troubleshooting the circuitry. I worked on the designing of the mechanical mounts and the pitching aspect of the project. I contributed by completing all the wiring as well as the soldering. I also coded the arduino and integrated all the sensors. I worked on the app associated with the project. I helped program the arduino microprocessor for the bluetooth communication and created basic logic that the circuit operates on.